Great Wall Motors is the first Chinese car manufacturer to debut in the Australian and New Zealand markets after its dealer launch in Sydney yesterday. Two twin-cab utilities, the V240 in both 4x2 and 4x4 (shown opposite) configurations and the SA220 in 4x2 only, are the first Great Wall models to be released onto the Australasian market. Both vehicles offer some value for money to Australian and New Zealand buyers, although it must be understood that Great Wall is a low-tech brand. The "Made in China" tag is expected to detract from any value that the brand may offer. The V240 4x2 will sell in Australia for a class leading $23,990 on road with the 4x4 option costing $3,000 extra, while the SA220 will sell for $19,990 on road. Both vehicles offer buyers electric windows, alloy wheels and air conditioning. 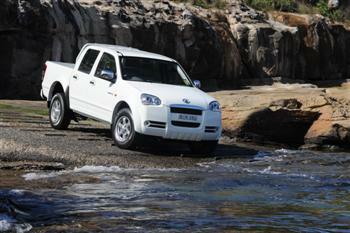 Many buyers are likely to see the Great Wall models as an alternative to a second-hand ute. Great Wall vehicles will be sold and supported initially in Australia by a nationwide network of over 45 dealers and will have a three year/100,000km warranty. The New Zealand range will be common to that sold in Australia with six dealers at launch. At the time of publication, Next Car had not been able to determine where any of the local dealers are located. “Every time we go to Great Wall's head office in Baoding, we are impressed by the progress that has been made since our last visit. We targeted Great Wall for our Chinese plans because they are highly disciplined, organised and well led,” said Mr Hull. Analysts are predicting that the Chinese automotive market will this year exceed 10 million vehicle sales replacing the USA as the largest market in the world. Great Wall Motor Company Limited is located in the industrial city of Baoding which is in the Hebei province of North East China, 140 km south of Beijing. The company was founded in 1976 and was the first Chinese automotive manufacturer to be listed on the Hong Kong Stock Exchange. Originally, the company specialised in manufacturing utilities and Sports Utility vehicles. Great Wall has been China's No. 1 manufacturer of utilities for the last 10 consecutive years and for the last five years Great Wall has been China's market leader in SUVs. Today, Great Wall boasts a range including recently released light and small passenger vehicles as well as MPVs. The company owns more than 30 subsidiaries and employs over 22,000 staff. At present, it has a production capability of 400,000 units which is set to expand to 800,000 units by 2010. Over the next three years Great Wall plans to make substantial additional investment in production and R&D facilities. The total anticipated investment will approach A$2 billion. By 2010, the annual output of 800,000 units is expected to realise sales revenue in excess of A$6 billion.